← What you make of yourself…! 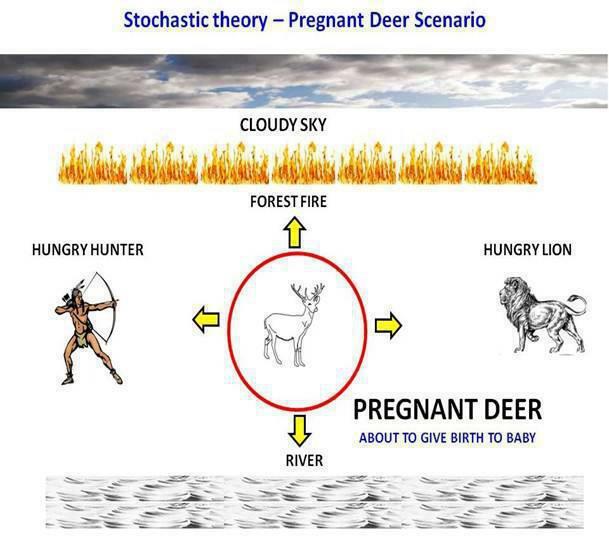 Consider this scenario: In a remote forest, a pregnant deer is about to give birth to a baby. It finds a remote grass field near by a river and slowly goes there thinking it would be safe. As she moves slowly, she gets labor pain…. at the same moment, dark clouds gather around that area and lightning starts a forest fire. Turning left she sees a hunter who is aiming an arrow from a distance. As she tries to move towards right, she spots a hungry lion approaching towards her. Will it give birth to a calf ? She does nothing. She just focuses on giving birth to a new LIFE. In a spur of moment …a lightning strikes (already it is cloudy ) and blinds the eyes of the Hunter. At that moment, he releases the arrow missing and zipping past the deer. At that moment the arrow hits and injures the lion badly. At that moment, it starts to rain heavily and puts out the forest fire. At that next moment, the deer gives birth to a healthy calf. In our life, it’s our MOMENT of CHOICE and we all have to deal with such negative thoughts from all sides always. Some thoughts are so powerful they overpower us and makes us clueless. Let us not decide anything in a hurry. Lets think of ourself as the pregnant deer with the ultimate happy ending. Anything can happen in a moment. In this realistic world, we can always expect MIRACLES…! If you are religious, superstitious, atheist, agnostic… or whatever… you can attribute this MOMENT as sublime, divine intervention, faith, sudden luck, chance (serendipity), coincidence… or a simple ‘don’t know’. We all feel the same. But, whatever one may call it, I would see the priority of the deer in that given moment was to giving birth to a baby…. because LIFE IS PRECIOUS.